027. ANTARCTIC ADVENTURE. Issued as a set of 30 cards by Sanitarium Health Food Company, Auckland, New Zealand (1972). Size: 2.85" x 2.25". Recto: Color photographs of various Antarctic subjects, as listed below. Verso: Typical text: One of a set of 30 cards | ANTARCTIC ADVENTURE | No. 1 Memorial Cross, Cape Evans | This Memorial was erected in 1917 by the survivors of Shackleton's Ross Sea Party of his Transantarctic Expedition 1914-1917, to the memory of three of their companions who lost their lives. Lieut. A. E. Mackintosh R.N.R. and V. G. Hayward perished on the sea ice in a blizzard in May, 1916; and the Rev. A. P. Spencer Smith died on 9th March, 1916. | Published in 1972 by | SANITARIUM HEALTH FOOD COMPANY | PRIVATE BAG, AUCKLAND | SWAPS: To obtain a full set of 30 cards swap with your friends; or post us one card for any card you need (stating its number) and enclose a stamped addressed envelope. 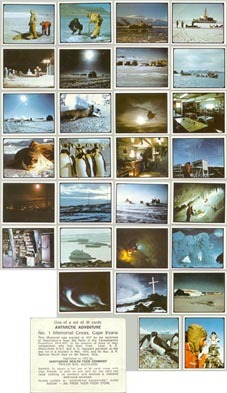 | PLACE CARDS IN "ANTARCTIC ADVENTURE" CARD | ALBUM -- 20c FROM YOUR FOOD STORE. No. 2 Scott's Hutt [sic], Cape Evans. Scott's Hut at Cape Evans is the most historic site in Antarctica. Established in 1911 for his journey to the South Pole, the hut is 50 feet long and 25 feet wide. It was later used by the Ross Sea party of Shackleton's Trans-Antarctic Expedition in 1915-1916. It was fully restored to its original condition by a team from New Zealand in 1960-1961. No. 3 Kitchen at Scott's Hutt [sic]. A party of New Zealanders cleared ice from Scott's Hut in 1960-1961 and carefully restored it to the condition it was when Scott left on his fatal journey in 1911. The kitchen has the original stove, utensils and supplies, Scott's bed and some personal belongings - a pipe, a pouch, an ink pot - still remain. No. 4 Scott Base in Summer. Scott Base was erected in January, 1957 and first occupied in 1957-1958 by the New Zealand component of the Trans-Antarctic Expedition. A well equipped laboratory provides facilities required for undertaking the following continuous programmes: seismology, geomagnetism, ionospheric physics, auroral and airglow, radio propagation, satellite tracking and meteorology. No. 5 Scott Base, in moonlight. New Zealand's Antarctic establishment, Scott Base, is close to Mt. Erebus, a 13,000 foot active volcano. Our expeditions are organised and operated by the Antarctic Division of the Department of Scientific and Industrial Research. Antarctica's ice sheet covers five million square miles and rises to over 10,000 feet, in the interior of the continent. No. 6 Icebergs, Moubray Bay. Icebergs are formed by the breaking away of large sections of the great ice barriers, or from the tongues of glaciers protruding into the sea. The largest ones resemble floating islands, many miles in circumference while the smallest are just chunks of ice. Icebergs have been sighted as far north as latitude 60 degrees south, but by this time they are usually in an advanced state of decay. No. 7 Decaying Iceberg, Cape Hallett. A drifting iceberg has only one-sixth of its bulk above water. Sometimes they are driven by wind and currents close to the land, where they become grounded. Under the influence of weather a process of decay sets in. This often gives rise to spectacular and beautiful formations. No. 8 Ice Cave Scott Base. Ice, in all its forms, rules Antarctica. This cave near Scott Base is formed by a snowfield cornice which has folded over and down until it has touched the sea ice at the foot of a concave hillside. There are winding tunnels, spacious galleries hung with hoar crystals and deep cracks in the clear, blue floor. The ice moves and creaks audibly. No. 9 Aurora. The Antarctic sky can be a spotless blue or a mass of fiery reds and yellows and, on winters nights the Aurora Australis, (or Southern Lights) a shimmering curtain of beautiful colours is sometimes seen. This is caused by inter-action between the earth's magnetic field and charged particles from the sun in the ionosphere 50 to 100 miles above the earth. No. 10 Ice Cave. Movement of the Ross Ice Shelf against Ross Island causes the formation of pressure ridges in the ice. The continual pressure causes the formation of cavities large enough for men to explore. The icecaves are lit by a blue green light filtering through the ice above and providing an eerie but beautiful colouring. No. 11 Drift Snow and Camp at Polar Plateau. While much of the scientific recording work in Antarctica is done from permanent bases, field camps are used for surveying, mapping and exploratory work. This one is on the Polar Plateau, 6,000 feet high, at the head of the Davis Glacier. The camps are moved in by air, and from these the men use motor toboggans to make short trips of exploration. No. 12 Emperor Penguin, Cape Crozier. The Emperor is the largest of all penguins, standing nearly four feet tall and weighing up to 80 pounds. He is well marked by a golden orange necklace, hence the name "Emperor". The chick of this superb bird is quite drab by comparison, resembling a grey bundle of fluff. The Emperor is the only Antarctic bird that rears its young in the darkness of the winter night. No. 13 Adelie Penguins. Birds, seals and whales are the only natural inhabitants of Antarctica. The most common bird is the Adelie Penguin. They are fully grown at about 18 inches high and weigh about 14 pounds. They live on fish and other sea life. These birds breed in immense numbers in their Antarctic rookeries in October and and they return to their winter home on pack ice in March. No. 14 Weddell Seal Pup. The Weddell seal is a true creature of the Antarctic. It lives close to the land throughout the year, keeping its breathing holes in the sea ice open by gnawing through with its strong teeth. The cows deposit their fast growing pups on the shore in November and they "baa" like lambs. McMurdo Sound has a population of several thousand and many live around Scott Base. No. 15 Sea Elephant. Following near extinction during the old sealing days, seals are now protected through international agreement and their numbers are increasing. The Sea Elephant usually breeds on the Sub-Antarctic Islands but small rookeries are found on the northern shores of the Antarctic continent. Sea Elephants are agressive and the bull will fight fiercely to protect his herd of females. No. 16 South Pole. The United States established this communications and weather recording station right at the South Pole in December, 1956. Captain James Cook first discovered Antarctica in 1773-1775. British explorer Ernest Shackleton reached within 100 miles of the South Pole in 1908-1909 and the first man there was a Norwegian, Roald Amunsden on 14th December, 1911. Englishman Robert Falcon Scott and four companions reached the Pole a month later but all died through food shortage and extreme cold on their way back to base. No. 17 Vostok. Vostok is an inland Antarctic Station of the U.S.S.R. The 18 months from July, 1957 to December, 1958 were set aside for scientists to work together and take observations in order to improve their understanding of the earth and its changes. Twelve nations set up stations in land around the continent from which to explore Antarctica, earth's least known area. Much data was gained and exchanged between countries and the work is still continuing. No. 18 McMurdo Winter. At the South Pole the sun disappears below the horizon for six months, but at the United States McMurdo Station, 840 miles north, the winter lasts four months. There is evidence to show that the continent is "warming-up" and temperatures in summer near the coast may rise above zero. However, coastal temperatures in winter plunge to -50°C and it drops to more than 100 below zero in the interior. Base facilities include this church, a hospital and post office. No. 19 Taking sample of lake bottom. These men are taking a sample of the bottom of a frozen lake through the ice. Antarctica has been set aside as an international reserve for scientific reseatch. Total land area is twice the size of the U.S.A. Ice is an average of 6,000 feet thick. The only plant life is in the icefree areas around the coasts where lichens and mosses grow. No. 20 Branding Seals. Branding seals and learning about their habits and environment is one of the tasks undertaken by men of the Antarctic to find and record all information of the coldest continent. There are four species of Antarctic seal--the crabeater seal, leopard seal, the rare Ross seal and the Weddell seal. Crabeater seals feed on krill, Ross seals on squid, leopard seals on penguins and other seals and Weddell seals on fish. No. 21 Surveying with Theodolite. A surveyor's work in Antarctica is difficult and dangerous. In setting up his theodolite to take levels, the handling of the knobs and screws can be painful. Gloves must be worn, for if the bare hand touches metal the skin sticks to it and the hand can be moved only by tearing off a layer of skin. As a result of the work of these devoted New Zealanders, the Ross Dependency has been accurately mapped. No. 22 Taking reading at Met. Screen. Meteorologists have discovered much about Antarctic weather and conditions that affect us in New Zealand. Antarctic weather is the world's fiercest. The high central South Pole Plateau in the middle of Antarctica is the coldest place on earth--minus 125 degrees F. The sun does not appear for six months of the year and, while it shines in "summer" the temperature still hovers around zero. No 23 The Ross Dependency Post Office. It provides full postal and communications facilities for men working permanently at and around the base and for the influx of visitors in the summer months. Ross Dependency stamps are issued. The base was erected in 1957, on Ross Island, for International Geophysical Year scientists, and has been manned permanently every year since by parties from New Zealand. No. 24 Scott Base Mess. While outdoor conditions at Scott Base can be unpleasant, the men working there today live under very modern conditions compared to those of the early explorers. This is their mess, or "dining room". It is part of a complex of nine solidly constructed huts, linked by a covered way. Auxiliary buildings include two magnetic huts, two seismology huts, an auroral tower and a hangar. No. 25 Dominion Range, Blue Ice. A dog-hauled sled is pictured on the blue ice of the Dominion Range at the head of the Beardmore Glacier. The great continent is not altogether white--there are areas of amazing colours in brilliant surfaces from violet, emerald and cobalt coloured depths. Antarctic is not silent either--blizzards howl and shriek and terrifying noises come from the moving ice. No. 26 Vehicles used at Scott Base. Most vehicles used in Antarctica are	developed specially for the cold conditions. Transport at Scott Base is provided by seven type of vehicle--from a Landrover with sand tyred wheels to big tracked vehicles, and, of course, motorised toboggans. The tracks are extra wide to prevent sinking into the snow. New Zealand still has some dogs but they are not now used as extensively as in earlier years. No. 27 Helicopter. Helicopters have become the workhorses of Antarctica. They support field parties and small summer stations within a 100-mile radius of their base. Their versatility has been largely responsible for the successful exploration of difficult access areas such as the dry valleys of Victoria Land. The first man to fly an aircraft in Antarctica was Sir Hubert Wilkins, of Britain, in 1928. Admiral Richard E. Byrd of the United States made the first flight over the South Pole in November, 1929. No. 28 Icebreaker, U.S. Eastwind. The icebreaker has perhaps done more than any other machine to make large scale Antarctic exploration possible. United States Navy icebreakers can cut channels through ice up to 15 feet thick through which cargo ships can follow. In spring Operation Deep Freeze icebreakers break up to 50 or 60 miles of channel in McMurdo Sound to allow in the first cargo convoy. No. 29 Supply Ship. Captain Robert Falcon Scott spent his first two Antarctic winters "frozen in" in his little wooden ship "Discovery". Today the icebreakers make it easy for supply ships to take food, fuel and equipment to the bases. The icebreakers cut a channel through the thick ice and the thinner-hulled cargo ships follow. No. 30 R.N.Z.A.F. Hercules at McMurdo. Flying from the United States air base at Christchurch Airport, the huge Constellation and Hercules aircraft carry stores, men and heavy equipment, such as ground vehicles, quickly to Antarctic bases. The Hercules is ski-equipped and is invaluable in conveying geological and survey parties to remote areas of the vast continent.